The key player assesses that CAPEX on Waste-to-Energy will reach $15.4bn in 2018. With a combination of mounting environmental concerns, increased governmental policy, more stringent renewable targets and a desire for increased domestic energy production, WtE is set for significant growth. Although some areas, namely Europe and parts of North America and Asia, have an established WtE market, there are real prospects for growth in regions such as Asia-Pacific and Eastern Europe. This report will ensure that you keep informed and ahead of your competitors. Gain that competitive advantage. 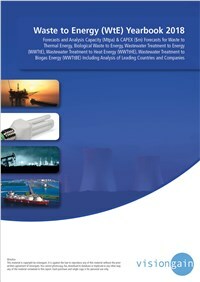 Report Scope: Waste-to-Energy (WtE) facilities are plants using municipal solid waste as a primary fuel source for energy production, this includes combustion and advanced thermal. The report covers the capex spending for new and upgraded WtE plants globally. The report also forecasts municipal waste processing by capacity for national markets through to 2028. What are the prospects for the overall Waste-to-Energy industry? Where are the major investments occurring? Who are the key players in the Waste-to-Energy industry? What are the market dynamics underpinning the sector? Mitsubishi Heavy Industries Environmental & Chemical Engineering CO. Ltd. This independent 500+ page report guarantees you will remain better informed than your competition. With 300+ tables and figures examining the waste-to-energy market space, the report gives you a visual, one-stop breakdown of your market including capital expenditure and capacity forecasts from 2018-2028, as well as analysis, aiding your knowledge and remaining that step ahead and helping you to succeed. Interested in a copy of this report?